4 Bedroom Detached House For Sale in Milton Keynes for Asking Price £375,000. Move in and do NOTHING ! This incredible 4 bedroom detached family home situated in Broughton is in SHOW HOME condition. 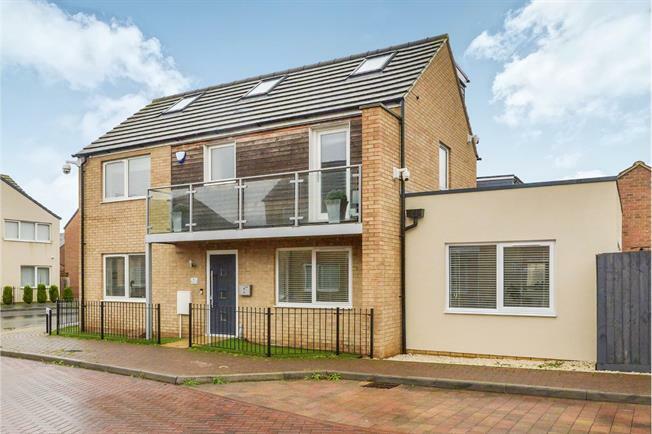 This property offers a generous amount of living space over three floors. This stunning property briefly comprises; Entrance hall, cloakroom, Kitchen diner, Lounge, dinning area with bi-folding doors leading to the beautifully designed rear garden. Three bedrooms on the first and family bathroom, bedroom two also has a balcony and EN SUITE ! On the second floor you have a stunning landing with doors leading to the shower room and the Master bedroom. Composite door to front, tiled flooring, door to living room, door to kitchen/diner and cloakroom, stairs to landing. Low level WC, hand basin, heated towel rail, tiled splash back and flooring, extractor fan. Fitted with a range of eye base level units with island and worktop over, built in double oven with gas hob with extractor fan over. Sink with mixer tap and drainer, integral dishwasher and washing machine, space for fridge freezer, tiled splash back and flooring, wall mounted boiler, storage cupboard, tv point, UPVC double glazed windows to front and side, composite door to rear driveway and garage. UPVC double glazed window to front, tv and phone point, two radiators, arch ways to dining room, electric fire place, laminate flooring. UPVC double glazed window to front and bi-folding doors to garden, radiator and laminate flooring. Carpeted stairs, doors to bedrooms 2,3 and 4, door to bathroom. Double bedroom with door to balcony with front aspect, tv point and door to en-suite shower room. Shower cubicle, low level WC, hand basin, heated towel rail, tiled splash back and flooring. Double glazed window to front laminate flooring, storage cupboard, radiator. Carpeted stairs and laminate landing, UPVC double glazed window to rear and velux to the front radiator, laminate flooring, TV point. UPVC double glazed to rear, velux to front, radiator, laminate flooring, tv point. Shower cubicle, low level WC, hand basin with vanity unit, heated towel rail, obscured UPVC double glazed window, velux, tiled walls and flooring. Metal up and over door with offroad parking to front. Low maintenance with patio and decked sitting area, artificial grass, power points, enclosed wooden fence with gate to side.